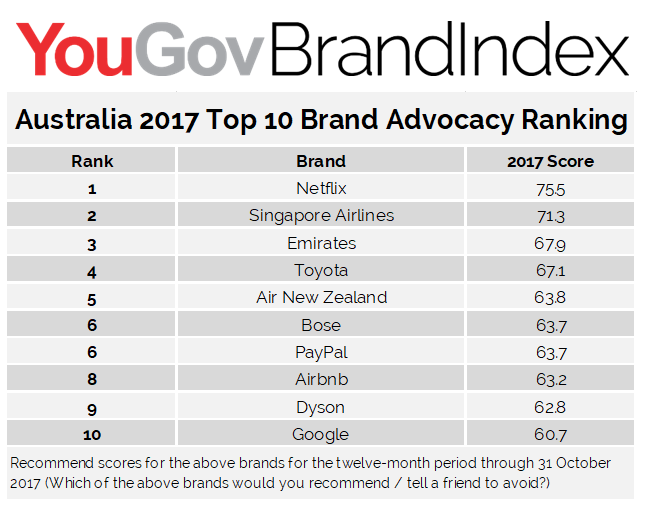 Aussie Netflix customers are the strongest advocates for the brand reveals the latest findings of the the YouGov 2017 Brand Advocacy Rankings. The rankings are calculated by measuring recommend scores among each brand’s customers for the twelve-month period through October 2017. Interestingly, car-maker Volkswagen, savaged after 2016’s emissions scandals – has topped the YouGov list for the biggest improver brand for advocacy. Malaysian Airlines was second. Recommend scores for the brands are measured by asking, “Would you recommend the brand to a friend or family member, or would you recommend that a friend or family member avoid the brand?”. Scores are calculated by subtracting the negative responses from the positive responses. In the 2017 rankings, Netflix comes out on top, with a score of 75.5. Airline brands also make up a large proportion of the top 10, with Singapore Airlines in second place with a score of 71.3, Emirates and Air New Zealand coming in at number 3 and number 5. Another travel brand with high levels of customer advocacy is Airbnb (at number eight). Elsewhere in the top 10, another brand with heavy emphasis on the consumer – Toyota – comes fourth (with a score of 67.1). There are also two high-end electrical manufactures in the list – Bose is sixth (with a score of 63.7), while Dyson comes in at number 9 (on 62.8). YouGov’s, head of data products, Ervin Ha, said, “A recommendation from friends or family is one of the strongest votes of confidence it is possible to give to a brand. While some traditional format brands continue to carry favour with consumers, the success of digital brands suggests that the conversation is changing. 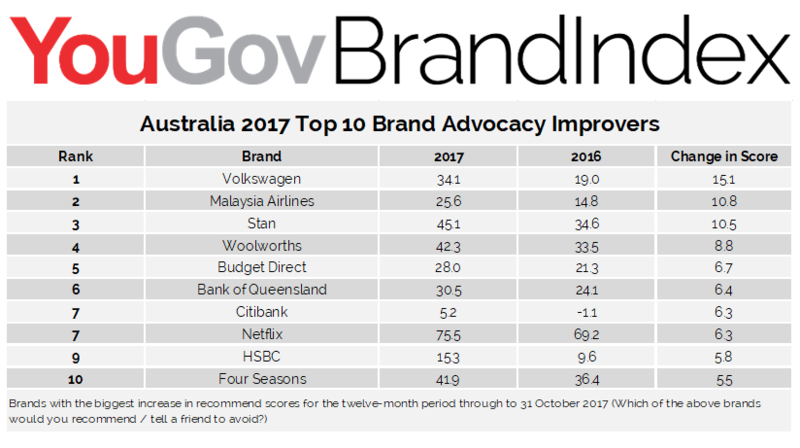 YouGov BrandIndex Brand Advocacy Rankings give brands a good indication on how well or poorly they have been doing in terms of their customer service, as well as quality of services and products provided. Looking at the best improvers ranking, brands can also evaluate whether they are doing a better job in winning customers’ mindshare. YouGov BrandIndex interviews thousands of consumers every day, yielding over 2.5 million interviews each year. Respondents are drawn from our online panels of 5 million consumers across 31 countries.